What Is The Point Of The Nissan 370Z Heritage Edition? The Nissan 370Z needs an urgent update. Adding some stripes and graphics and calling it a "Heritage Edition" doesn't count. 48 years seems like an odd anniversary to commemorate, but that’s exactly what Nissan has done with the 370Z Heritage Edition. 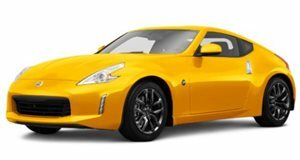 More specifically, the manufacturer says that the Nissan 370Z Heritage Edition honors the fast approaching 50th anniversary of the iconic Nissan Z-car. But that’s still two years away, since the original Datsun 240Z launched in 1969. We’re just as bewildered as you are about Nissan’s logic. Revealed ahead of its debut at the New York International Auto Show, the 2018 370Z will feature a refreshed design. Set to go on sale this spring, the 2018 350Z will include new front and rear lights, a revised grille, new rear fascia paint scheme, smoke chrome door handles and a new EXEDY high-performance clutch. Opt for the Heritage Edition package, and you’ll get a choice of two exclusive colors. The Chicane Yellow Heritage Edition features black outside mirrors, gloss black graphics and yellow interior trim, while the Magnetic Black Heritage Edition includes gloss silver graphics and yellow interior trim. "Over the past five decades there have been a number of special Z® trim packages that have added a sense of customization straight off the showroom floor," said Nissan America’s Michael Bunce. The new 2018 370Z Heritage Edition honors that tradition, blending it with the modern design and performance of the 2018 370Z." If you were hoping for a performance boost, prepare to be disappointed. Nissan will offer the same 3.7-liter, 332-horsepower V6 engine for the 370Z since it launched in nearly a decade ago with a choice of a six-speed manual or seven-speed automatic. The aging Nissan 370Z is getting on a bit now, yet some of its sports car competitors have received several generational upgrades in that time. Adding some stripes and graphics isn’t going to tide us over until the inevitable 370Z successor. At least the the GT-R Track Edition will also be at the show. A dated and soon to be replaced sports coupe has one last dance in the desert.